I hope this isn't the cream of the crop. Until recently, I was unaware that a rival pinball game existed on the Switch: Pinball Arcade. 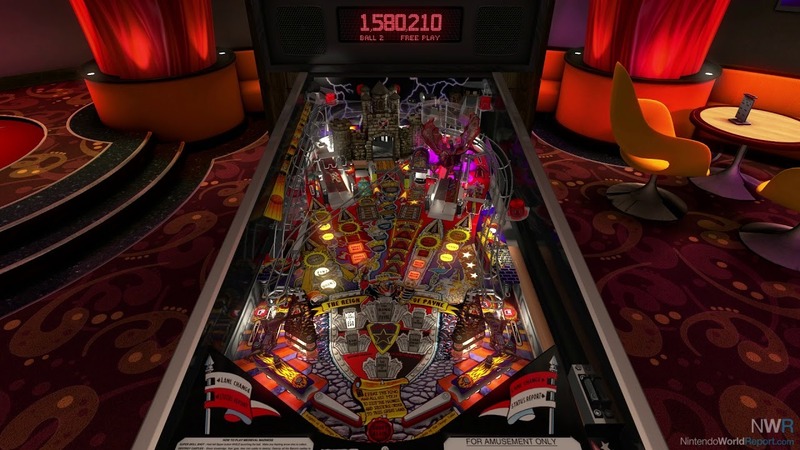 This collection, from FarSight Studios, featured real-world pinball tables, many from Bally and Williams, that are highly regarded. Sadly, Pinball Arcade recently lost the rights to the Bally and Williams tables, which severely slashed their number of available tables. This is a real shame, but Zen Studios has snatched up at least the Williams tables and are making them available in packs of three or four. Volume 1 includes Fish Tales, Medieval Madness, Junk Yard, and The Getaway: High Speed II. Sadly, only one of these is unambiguously amazing—the rest are kind of dull. Let’s start with the best table: Medieval Madness. This is a long table with a castle centerpiece, several loops, and two “trolls” that pop up in front of the castle and must be knocked down. Your primary goal is to destroy the castle—this is mostly done through hitting it repeatedly. Other goals include looping combos, hitting ramps, and completing loops in order to activate “Madness” states, which feed into the many different versions of Multiball available in Medieval Madness—one of which features a whopping five balls for you to juggle. In real life, this table implemented a feature that would stop the ball from draining between the flippers after a failed ramp attempt. This appears to be replicated in the virtual version, as I had significantly fewer gutter balls than the other three. Medieval Madness is super fun and I’ve achieved all but one challenge star on it. I don’t want to say that Fish Tales is a bad table, but Fish Tales is a bad table. The layout is strange and not much is there to do. Your main goal is to “catch fish” by hitting targets, and then “exaggerate their size” by hitting a spinner within 10 seconds. Other goals include locking balls to activate Multiball and activating a cute dot-matrix minigame in which you try to shoot down waterskiers but not boats. In real life, this table had shorter-than-regulation flippers (about 1/8 inch shorter apiece). I have to assume that’s been replicated here, as I had way more gutter balls (both between the flippers and through the actual gutters) than any other table. Both the One-Ball Challenge and Survival Mode are incredibly frustrating. Fish Tales is a bad table. Junk Yard is probably the second-best table in this pack; it’s fun but weirdly random. Your goal is to build objects with scrap that you “find” in the junkyard. The table features a pinball held aloft by a string that you can hit—it’s supposed to be a “crane.” A dot-matrix minigame where you try and hit a bulldog with pieces of toast while avoiding a girl is there as well as another minigame where you try to outrun the bulldog by mashing the flipper buttons. I still haven’t really figured out Junk Yard, but it’s a fun table that holds up well in both One-Ball Challenge and the Five-Minute Challenge. Survival Mode is more of a gamble. Similarly, The Getaway: High Speed II is hard to work out. The goal seems to be to consistently shoot the ball through loops—one loop leads to a “Supercharger,” which is a very cool visual and actually speeds the ball up. Other than trying to lock balls for Multiball, the table doesn’t seem to have many other objectives that don’t simply result in bonus points. I also had some problems with outside gutter balls here, not as bad as Fish Tales, but gutter balls always feel like robberies. The “Supercharger” feature makes this an interesting table, but I didn’t love it. 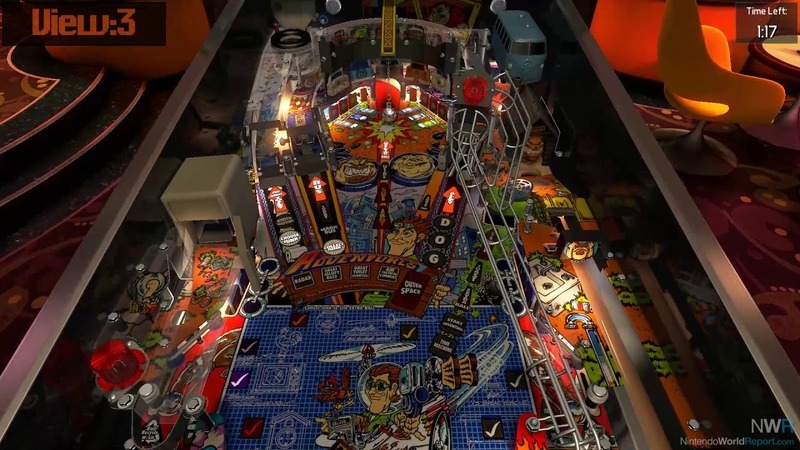 All of the tables have a toggle between spruced-up Pinball FX3 graphical effects (like a fisherman standing on top of the table or explosion effects on the castle) or simply the original look. Swap between them with the B button at any time. I find that the FX3 effects don’t add a lot, and are in some places distracting, so I kept them off. Sadly, all four tables have been censored or changed in some way to comply with Pinball FX3’s E rating. This includes removing all references to alcohol or smoking, cleaning up the language in voice samples, and changing some of the cabinet art. I would not have noticed any of these changes had I not become aware of them (the lists of changed content are in each table’s “legal” tab), but I’m a bit disappointed because of what it implies for future Williams tables (or Bally tables if Zen gets those, too). For example, given Pinball FX’s E rating, we’ll probably never see the Elvira tables. I’m excited to see more Williams tables, as they are consistently praised, but of these four initial releases, I only fell in love with Medieval Madness. Hilariously, you cannot escape Fish Tales, because it will be distributed for free to anyone who already has Pinball FX3. Perhaps they knew nobody would actually buy it?